Squeezed in between the Guildhall and No. 201 on the High Street, the Turk's Head left was one of Exeter's oldest surviving inns. It closed in 2005 and is currently part of a chain of Italian restaurants called Prezzos. The front could hardly be plainer: a series of large sashed windows, with no glazing bars, two on the first and second floors with a single window on the third floor, above which is a half hipped slate roof hidden from street level by a low parapet. It's all a bit dull but, as so often in Exeter, the history of the building itself is a lot more interesting! A building on this site is first mentioned in a deed of 1289 by which the civic authorities granted the owner of the land the right to place a beam against the wall of the Guildhall for a rent of one penny a year. It's highly likely that the present narrow frontage of No. 202 respects the medieval dimensions of the earlier building. 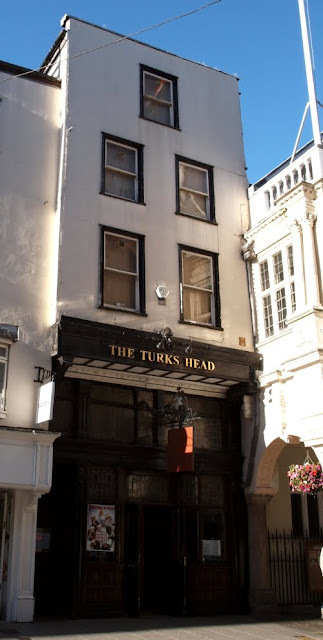 Eric Delderfield, in his book on inn signs, believed that this early date gave the Turk's Head a "very good claim" for being one of the oldest inns in England. (Unlikely, unless the 13th century deed specifically mentions a tavern being built here rather than just a tenement. Hoskins, along with others, believed that the mid-15th century New Inn on the High Street was the oldest inn in Exeter with a connected history.) The photograph below right c1880 shows the Turk's Head to the immediate left of the Guildhall prior to the early-20th century remodelling of the ground floor. It's possible to see the suggestions of an oversailing second floor. The late-18th or early-19th facade conceals the remains of a much earlier building, the core of which is timber-framed. 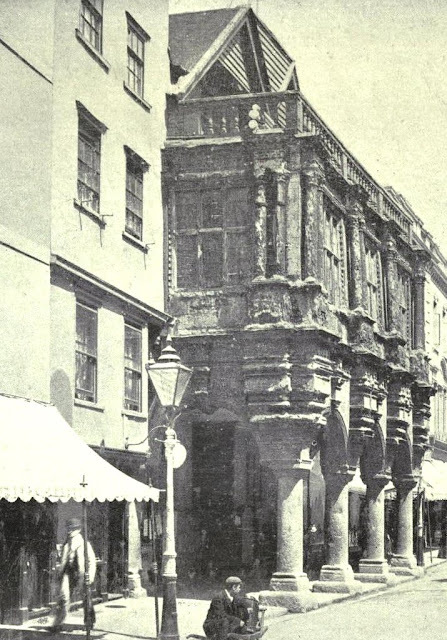 On his website, Exeter Memories, David Cornforth states that five medieval fireplaces were discovered when the structure underwent refurbishment in the early 20th century, which is when the ground-floor street frontage was also added. A fire in the 19th century probably put paid to many of the remaining historic features. The property currently extends from the High Street all the way back to Waterbeer Street. This is the result of an amalgamation which took place in 1899 between a building on Waterbeer Street called the Guildhall Vaults and the Turk's Head. 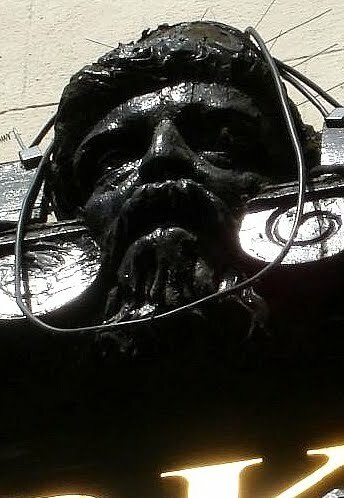 Underneath this part of the Turk's Head is a cellar that was once used to enter the cellars of the Guildhall itself. For centuries a narrow alley called Bussel Lane ran down the left side of the Turk's Head providing access from the High Street into Waterbeer Street, much like Parliament Street still does today, although this route has long been blocked. The early-20th century ground-floor street frontage is shown left. The door to the left of the main entrance marks the original position of Bussel Lane. Charles Dickens is alleged to have visited the Turk's Head during one of his visits to the city and modelled the character of Joe ("Fat Boy") in The Pickwick Papers on one of the inn's servants, although the evidence for the claim is scant. Dickens certainly did visit the city several times, staying on at least one occasion at the late-18th century New London Inn (demolished in 1936). Despite the many changes the inn was one of Exeter's more atmospheric hostelries and it was unfortunate when it finally closed in 2005. The Grade II listed building is still known as the Turk's Head and the carved saracen's head still exists above the entrance below but the ground floor interior has been totally altered to cater for its current usage as an Italian restaurant.